Lee Padrick and I prefer to sight fish for redfish on the flats and along the marshes of North Carolina. Consequently, it is imperative that we use quality polarized sunglasses to cut the surface glare, which increases our probability of finding schools of redfish. Another necessity is we need them to be tough enough to meet the demands of tournament pre-fishing while helping us identify our targets at farther distances. We need the distance because the further away we can identify our quarry, the less probable that we spook it. Every year, we evaluate our fishing equipment and gear to see if any advances in technology have occurred. We cannot afford to ignore technological advancements that could help us get an edge over our fellow competitors. While doing some research, we discovered Salt Life Optics polarized sunglasses. Made by Italian craftsmen, Salt Life Optics has stormed onto the polarized sunglass market. Their attention to detail is evident when examining Salt Life Optics lightweight but durable plaques and lens. Their quality plaques are screwed in, not glued, giving these glasses a high end feel at a reasonable price. But the real selling point is their polarized polycarbonate injected lenses that are made by a name that all outdoorsmen and women are familiar with, Carl Zeiss. Zeiss has been producing precision optics for 160 years and certifies that every Salt Life Optic lens meets their proven quality standards. Their lenses have unsurpassed clarity and provide 100 percent UV protection, which in turn helps reduce eye irritation. Plus, their anti-reflective AR5 coating reduces glare and bounce back without color distortion giving true color recognition, which translates into a reduction in eye fatigue. All these qualities will make time on the water more enjoyable and exponentially more productive. 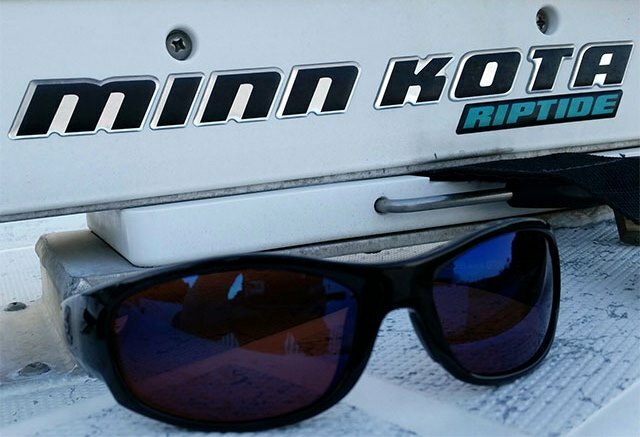 In addition, their lenses are scratch and impact resistant and will not delaminate when exposed to saltwater or extreme weather conditions, making purchasing a pair of Salt Life Optics a good decision for any serious fisherman or lady. Now that Lee and I have decided to use Salt Life Optics in 2015, let the field testing begin. Over the next year, we will put them to the test and keep you guys informed on how they are performing and holding up to the rigors of competitive redfishing. Please follow us on our social media platforms- on Facebook: The Redfish Guys; Twitter: @Pirasea1 and @LeePadrick; Instagram: Dwayne.Smith.Fishing and finally our website www.TheRedfishGuys.com.